A delicious way to serve some ice cream. 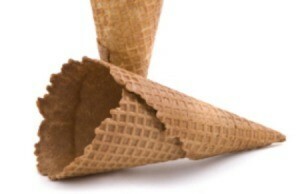 This guide is about chocolate dipped waffle cones. The kids are doing these for friends on Valentine's day. They taste pretty good. Melt chocolate in double broiler. When melted, dip cones in chocolate or drizzle on with a spoon. Set cones on a cookie sheet lined with waxed paper. Let dry, then fill with candy of your choice. Wrap with cellophane and tie at top with ribbon to hold candy in.